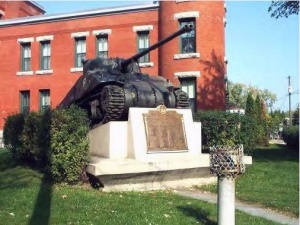 The M4 Sherman is an American tier 5 medium tank. 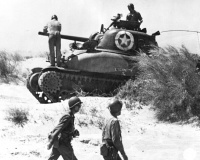 This was the U.S. Army's best-known tank of WWII. 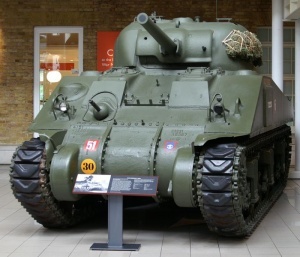 In WoT, the M4 Sherman is considered a very well rounded tank. It has good mobility and speed, and the armor, when manually angled, provides moderate shielding. 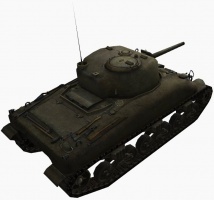 The most popular gun for this tank is the 105 mm M4. It offers great damage, but sacrifices penetration. However, with a 100% crew, Improved Ventilation, and a Gun Rammer, the reload speed can go down to 7.50s and under, providing high damage per minute, especially when keeping an enemy tracked with HE to the tracks, a highly effective way to eliminate high HP enemies. The other "best" gun is the less popular 76 mm M1A1. This gun offers much better penetration, but loses 400+ alpha damage if a 105mm HE shell would penetrate, or 350 damage for a penetrating HEAT round. The M1A1 is a better sniping gun and is much more reliable in its DPM when used correctly. 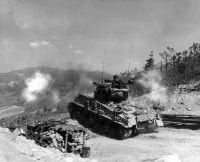 The M4 Sherman leads to the M4A3E2 Sherman Jumbo, and the M4A3E8 Sherman. The M4 Sherman is considered a very well rounded tank like the T-34 or Pz. IV H, and is often considered one of the best, if not the best, Tier V medium. 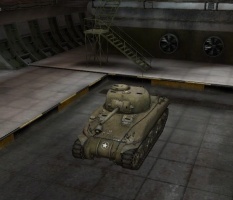 Its hull armor is a bit lacking and will most likely be penetrated by other tanks of its tier. However, it is not hopelessly thin; many lower-tier tanks will have a difficult time punching through the front armor. Its speed and maneuverability are average. 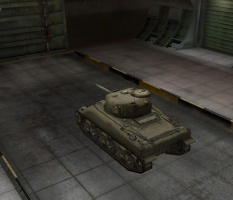 Overall this tank is the Jack of All Trades of tier 5, and offers great guns for its tier. 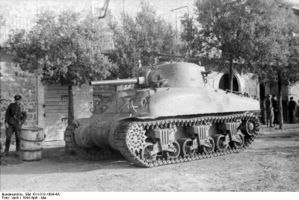 Due to its great gun depression it can fight on hills and use terrain features much more effectively than its counterparts, which is a compensation for its weak armor. 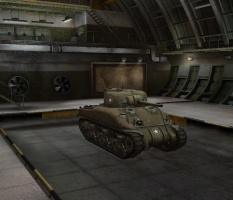 By only exposing its strong frontal turret it can consistently damage enemies while bouncing shots itself. Depending on the gun equipped, the tank may need to change tactics to match. The stock 75mm Gun M3 has decent handling (although somewhat less so than its German counterparts), and able to shred lower-tier tanks, especially light tanks. 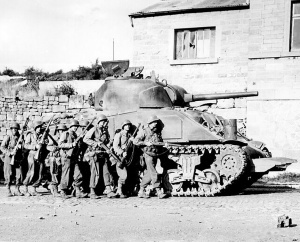 However, its low penetration, an issue in WWII, remains so in World of Tanks. 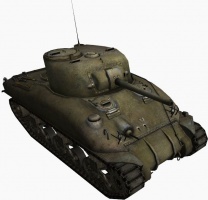 Both of the Sherman's gun upgrades, the 105mm Howitzer M4 and the 76mm M1A1 are considerably more effective than the stock gun. The 105mm Howitzer M4 is a very powerful, close-range gun capable of damaging many opponents, if not outright killing them. 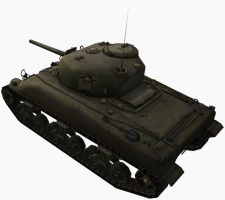 While its has a long aim time, slow reload and low accuracy, the large HE charge in each shell will certainly one-shot many Tier IV vehicles, some Tier V tank destroyers and even Tier VII artillery. Although it may not destroy many of the thinner-armored tank destroyers in one hit on account of their hitpoints, it is still capable of severely damaging them, such as Hellcats. The large HE charge however, it largely ineffective against extremely heavy or spaced armor. Even if minimal damage is done, it is still capable of damaging internal modules and knocking out crew easily. It can also be fitted with the stock turret, easing the grind on the M4 considerably. The 76 mm Gun M1A1 is also another powerful option. While it may not have the raw power of the 105mm Howitzer M4, it possesses a very high-penetration gun capable of challenging most opponents. 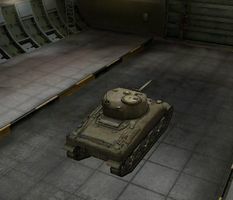 It is far more consistent in terms of damage, and can fire extremely effective premium ammunition that can punch through the frontal armor of almost all tanks it will face. 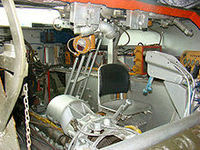 In addition, with this gun mounted one will be able to carry a respectable amount of munition on board. The HE round, while never as powerful as 105mm howitzer shells, is still suitable for situations where HE is desired. However, it is less accurate than its Czech, German and Japanese counterparts, though still managable. Therefore, medium range is optimal engagement range. Generally, go for tracks, then gun (105mm M4, which doesn't require the next turret and stock turret has better armor), then engine, then radio, then turret. 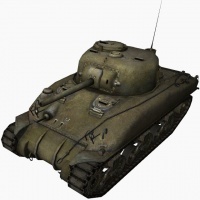 If you want the M1A1, then research tracks, turret, M1A1 (gun), engine, and radio. 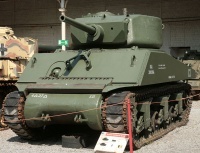 The Sherman depicted in World of Tanks is an M4A1, noticeable by the cast hull (all other Sherman variants had welded hulls). This variant was never armed with the 105 mm M4 howitzer. 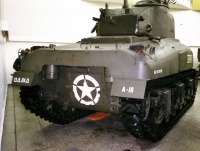 * The Sherman depicted in World of Tanks is actually an M4A1, noticeable by the rounded cast hull (all other Sherman variants had welded hulls with sharp edges). 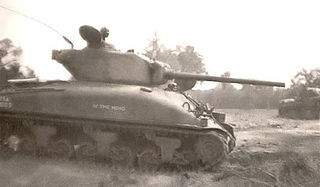 M4A1 variant was never armed with the 105 mm M4 howitzer. This page was last modified on 10 October 2018, at 13:32. This page has been accessed 700,490 times.